Deciduous geophyte 70-170 mm tall when in flower, tuber turnip-shaped or elongated, sometimes moniliform with several growing points. Simple or compound with two or more lateral pinnae at the base of the laminae, green, petiolate. Lamina (or median pinna) ovate or widely ovate, base cuneate or truncate, apex obtuse or rounded, margin entire, 10-30(-40) x 5-20(-35) mm, lateral pinnae 4-9 x 4-6 mm, adaxially and abaxially sparsely hirsute with long appressed hairs interspersed with short glandular hairs, margins ciliate. Petiole 10-50 mm long, prostrate to erecto-patent, hirsute with appressed curly hairs interspersed with long and short glandular hairs and sometimes long stiff non-glandular hairs. 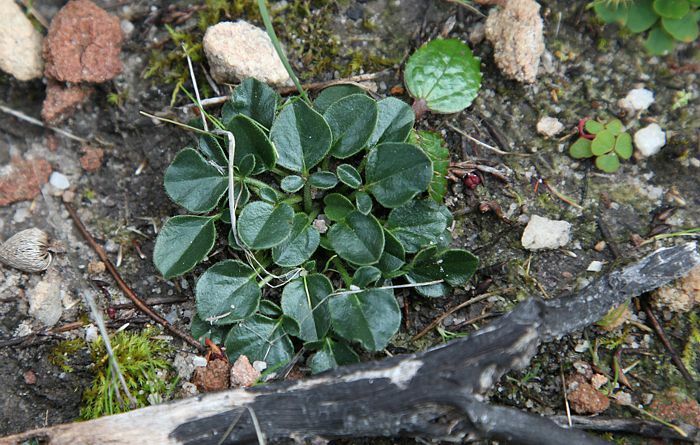 Stipules subulate, adnate to petioles for two thirds to sometimes their entire length. 5, lanceolate, apices acute, 6-8 x 1.5-2 mm, recurved, reddish brown with white or pink margins. Hypanthium 7-19 mm, reddish brown. 5, pale pink to bright pink, apices recurved during anthesis, posterior two with wine red feather-like markings or a single blotch in the centre, ligulate, claws white or pale pink, auriculate, 4-6 mm long, apices rounded, truncate or emarginate, 10.5-15 x 2-4 mm, anterior three unguiculate-spathulate, claws filiform, 2-3.5 mm long, apiecs ronded, 7.5-13 x 1.5-3 mm. 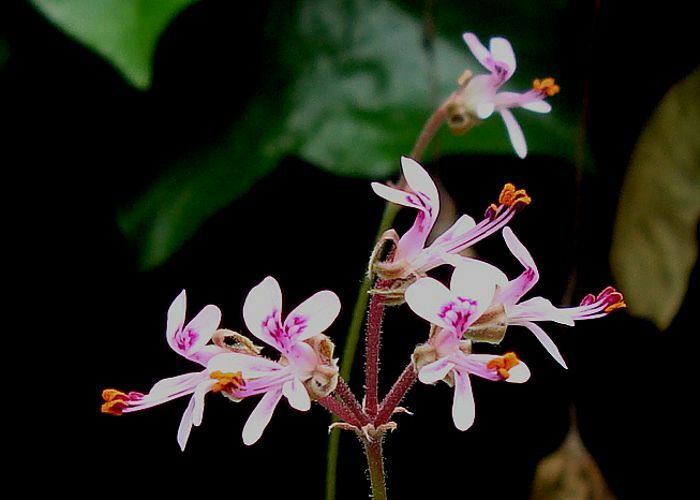 5 fertile, protruding from the flower, posterior one 7-10 mm, lateral two 7.5-10.5 mm, anterior two 8-11 mm long, pink to white red. 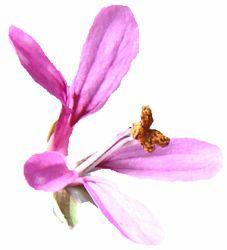 P. triphyllumis found in mountain fynbos on slope with relatively high rainfall, 400-1000 mm. 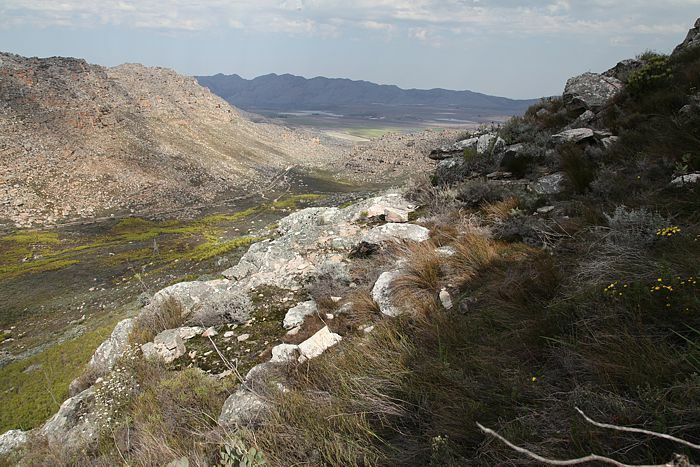 In the above photograph is the southern slope overlooking the Witzenbergpas, where minute rosettes are found on rocky ledges in shallow soil. 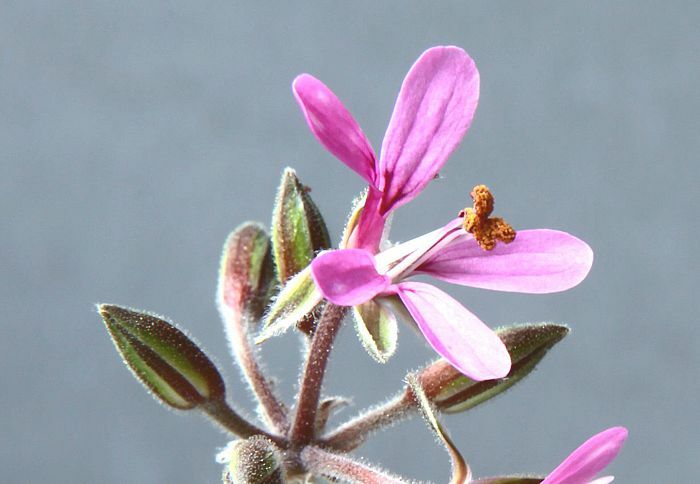 The flowers of the Agter Witzenbergpas plants are very small, perhaps about 10 mm in diameter. These are truly beautiful plants, no bigger than another miniature from the southern Cederberg mountains, P. saxatile. 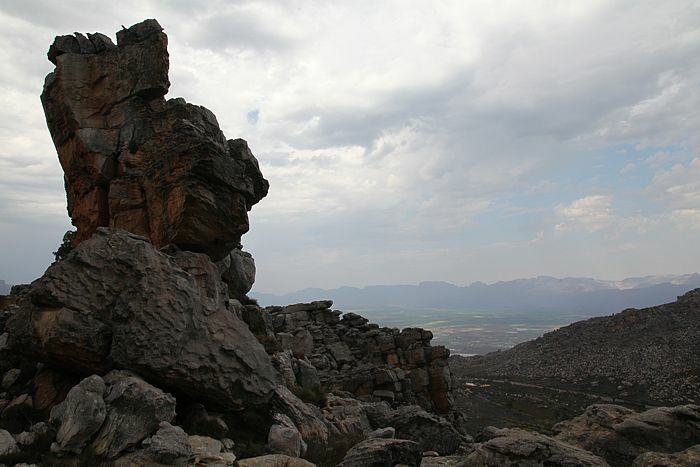 The Cederberg slopes and ridges are difficult to navigate, with unstable rocky terrain and often deep vegetation, requiring proper mountaineering boots. However, the views are amazing, here overlooking the valley towards Prince Alfred Hamlet, and further towards Ceres, one of the most fertile valleys in the Cape. 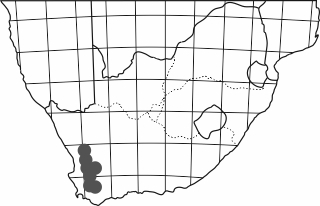 E. M. Marais, Taxonomic Studies in Pelargonium, Section Hoarea (Geraniaceae), PhD Thesis, University of Stellenbosch.